Karlene Smith of Real Living Real Estate Experts in Warren, PA was awarded the highest level of service achievement in the real estate industry, Quality Service Certified® Platinum. The award is in recognition of earning 100% client service satisfaction in 2015, as measured by Leading Research Corporation (LRC). Client feedback from the surveys becomes part of the agent’s credentials. An overall satisfaction rating is displayed on the consumer websites (www.QualityService.org and www.RatedAgent.com) where buyers and sellers have the ability to select a real estate professional based upon each agent’s validated record of service satisfaction. 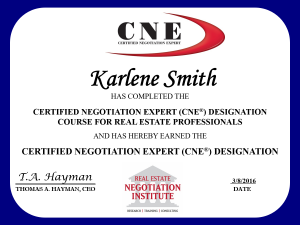 Karlene Smith has been awarded the Certified Negotiation Expert(CNE)designation from the Real Estate Negotiation Institute (RENI). The CNE is earned by real estate professionals after successfully completing formal negotiation training over two days. Agents who receive this certification are among the top agents in the country in negotiation skills. Warren, PA 5/27/2016– Real Living Real Estate, a real estate brokerage network operated by HSF Affiliates LLC, with Real Living Real Estate Experts, today announced the brand was named “Real Estate Agency Brand of the Year” and “Most Loved” real estate brand in the 28th annual Harris Poll EquiTrend® study. Real Living Real Estate received the highest ranking in the Real Estate Agency category based on consumers’ perception of its brand familiarity, quality and usage consideration. Additionally, Real Living Real Estate is rated the “Most Loved” real estate brand among those considered in the Harris Poll EquiTrend® study, underscoring respondent’s emotional connection to the brand. The study is based on opinions of more than 97,000 U.S. consumers surveyed online earlier this year. “We are thrilled that Real Living Real Estate received this amazing recognition from the consumers we serve every day,” said Karlene Smith Broker/Owner of Real Living Real Estate Experts. “This is a huge momentum-builder for us, we are so proud to be associated with and have the support of such a strong brand. With all the different marketing technics and technology available today a strong brand helps us stay up-to-date with the most recent trends. Real Living Real Estate received the highest numerical Equity Score among real estate brands included in the 2016 Harris Poll EquiTrend® study, which measures and compares the brand health of more than 3,800 brands across nearly 500 categories from airlines and apparel to retailers and real estate. The key measure used in the study is Nielsen’s twice-validated measure of brand equity. Consumers responded with their brand perceptions, gauging their emotional connection to the brand, plus brand awareness, influence and familiarity. Harris Poll EquiTrend® honors add to Real Living Real Estate’s momentum as judged by consumers. Real Living Real Estate Experts proudly participates in Real Living 360 ServiceSM, a program that tracks local customer satisfaction with buyers and sellers from every transaction. 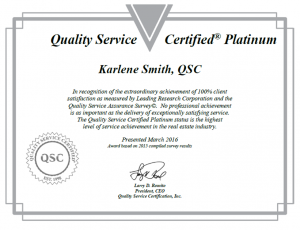 The program results are monitored by Quality Service Certification, Inc., an independent research firm. Real Living Real Estate received the highest numerical Equity Score and the highest numerical score relating to Love among real estate agency brands included in the 2016 Harris Poll EquiTrend® Study, which is based on opinions of 97,120 U.S. consumers ages 15 and over surveyed online between Dec. 22, 2015 and Feb. 1, 2016. Your opinion may differ. “Highest Ranked” and “Most Loved” are determined by a pure ranking of a sample of real estate agency brands. Real Living Real Estate is a full-service real estate brokerage franchise company with a comprehensive and integrated suite of resources for franchisees and their sales professionals, as well as for consumers who work with them. The brand and its innovative concepts were recognized by Entrepreneur magazine; have won Inman Innovator Awards, and been named “the Most Promising New National Brand” by the Swanepoel TRENDS Report. Real Living Real Estate is a network brand of HSF Affiliates LLC, majority owned by HomeServices of America, Inc., a Berkshire Hathaway affiliate. For information on Real Living Real Estate Experts, visit www.RealLivingRealEstateExperts.com.